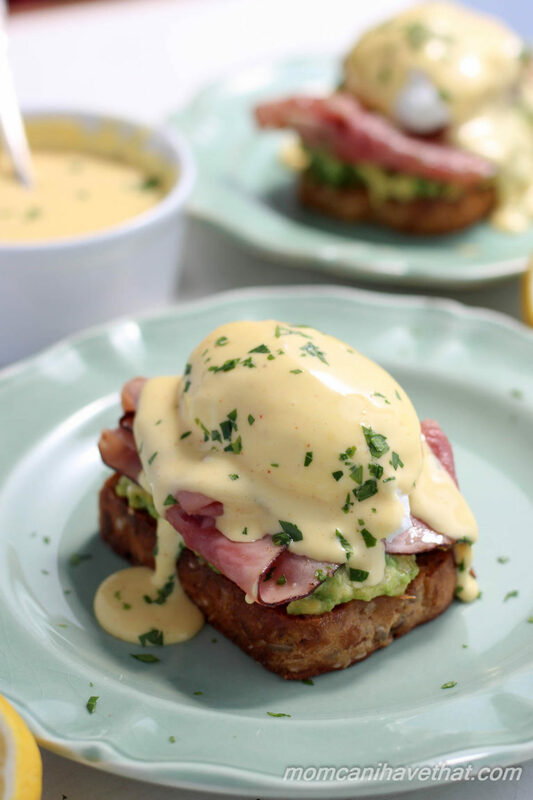 Enjoy this recipe for avocado on toast with poached egg with ham and blender Hollandaise while keeping it low carb and gluten-free. Eggs Benedict? Scrumptious! I know, I’m joining the bandwagon really late. I always seem to be on my own cosmic time clock, but avocado toast!!! Yes, this is what my nice Sunday breakfast or brunch dreams about. Avocado plus toast equals a super yummy combination all on its own, but then add a poached egg and blender hollandaise and like I said…. Sunday breakfast dreams people! Other bloggers have been posting avocado toast on their blogs and Instagram accounts for the last few years or so. The avocado earned almost over-night fame several years ago when low carbers, cross-fitters and those following a Paleo diet decided to embrace fat. Avocado, and it’s bff bacon, suddenly appeared in almost everything sweet or savory. And toast became really popular last year. Everything imaginable was put on toast and even burned toast scrapings were used to top some of the most innovative dishes in some of the top restaurants. So, I’m sure all of you are jaded when you hear the words poached egg on avocado toast, but…. This is one of the yummiest things I have had for breakfast in a long time! I have been making a lot of poached eggs lately after deciding I needed a change from eating the same Spinach, Bacon & Onion Crustless Quiche every day for breakfast — for years. I did a review of Sukrin’s low carb and gluten-free Sunflower Pumpkin Seed Bread last month and was super excited to try it out as a base for poached eggs. Why? It’s to die for and I love a good chewy, seedy bread. I’ll admit it, I MISS BREAD! Am I the only one? Using this bread as a base for poached eggs was absolutely perfect. I’m in-love with the combination. I know, you’re going to balk at the price of the bread mix and I wouldn’t blame you. But, let me talk about the bread for a minute. It really tastes phenomenal. As my readers know, I’m the kind of person who likes to bake and make almost everything from scratch. And while I don’t mind taking a short cut by using a prepared product to save time, I can’t even name one mix I’m willing to buy. That’s not true. I like King Arthur’s Gluten-free Bread Mix and make it sometimes for my kids. But this is definitely something I like to have in my pantry for a nice breakfast or brunch. I got 8 thick slices of toast out of the bread and was still able to enjoy the ends with butter. (Come on, I know it’s your favorite part, too!) Just so you know, the mix serves 12 — I just cut my slices thicker to use in this recipe. Let’s talk about the recipe. It is not very hard to put together, but does require that the bread be already made. Let me assure you that this “just-add-water-to-the-mix-and-bake-in-the-cute-little-aluminum-pan-provided-in-the-box” mix is as simple as can be, and my post provides some nice tips and tricks to help you get a really pretty loaf. If you don’t have or aren’t interested in the low carb bread mix and you want to MAKE THIS RECIPE RIGHT NOW, then use your favorite low carb bread option. 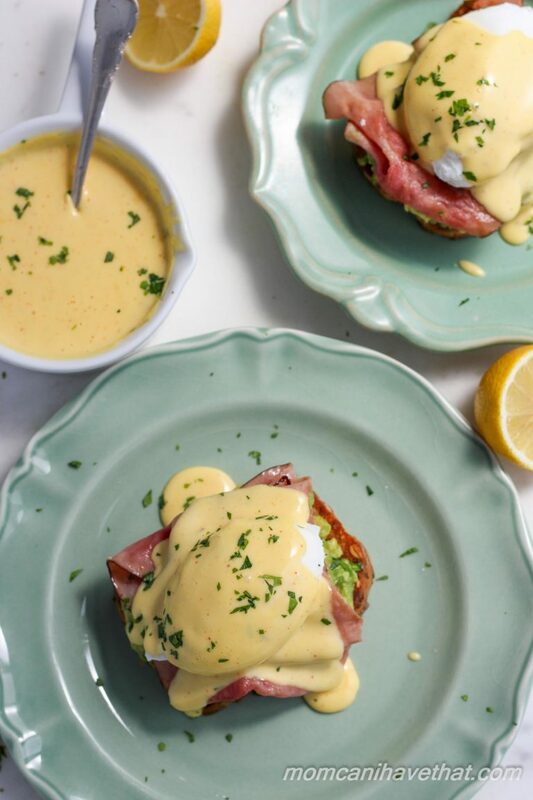 Looking to snazz up that Hollandaise sauce? 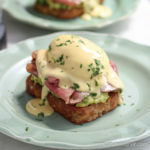 This Blender Hollandaise post has lots of ideas! 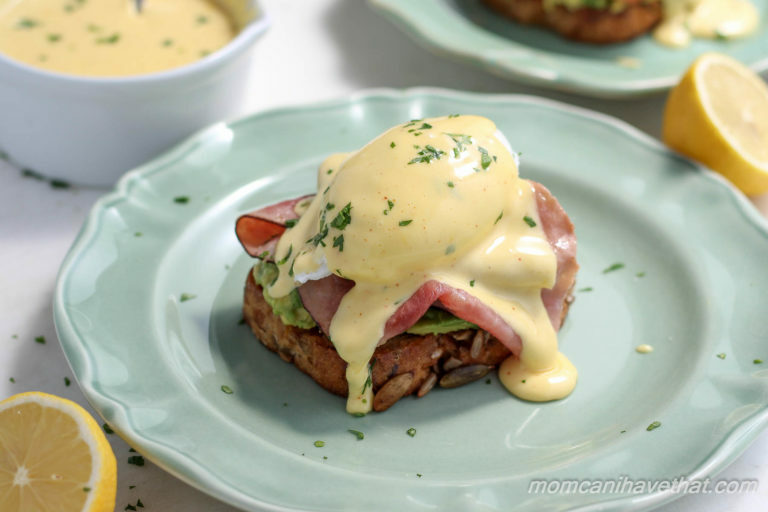 Enjoy this recipe for poached egg on avocado toast with ham and blender Hollandaise while keeping it low carb and gluten-free. Toast: Place a medium to large frying pan or skillet over medium heat. Spread a thin layer of butter on the top side of each piece of the Sunflower Pumpkin Seed Bread When the pan is hot, place the bread buttered side down in the pan to toast. Butter the other sides while it they are cooking then flip and toast the other side. Remove to serving plates. Avocado: Coarsely mash the avocado and add the lemon juice and salt to taste. Divide it among the four pieces of toast. Ham: Place the ham into the butter coated frying pan and cook it over medium heat until it warms and begins to crisp. Divide it among the four servings and place on top of the avocado. Garnish with parsley, cilantro, capers, black pepper or cayenne. Your pictures make me drool. We spent a few nights in a hotel last week and we had simillar toasts(with regular bread) everyday for breakfast. Delicious!